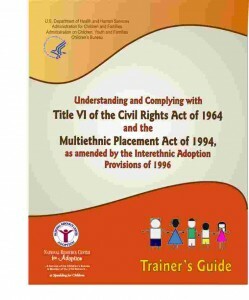 This curriculum, Understanding and Complying with Title VI of the Civil Rights Act of 1964 and the Multiethnic Placement Act of 1994, as amended by the Interethnic Adoption Provisions of 1996, includes written materials and that are easily used by the trainers and training participants. Icons and print variations are used in the Trainer’s Guide to engage you in the training process through the use of team activities, large group discussions and individual exercises. In the Trainer’s Guide, the trainer’s preparation pages are printed on blue paper; materials used in training are printed on white paper, and materials referenced but not trained are printed on pink paper. We encourage the States to use the color coded system when the Trainer’s Guide is printed. 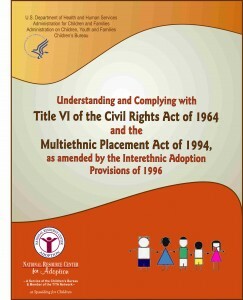 This curriculum, Understanding and Complying with Title VI of the Civil Rights Act of 1964 and the Multiethnic Placement Act of 1994, as amended by the Interethnic Adoption Provisions of 1996, includes a Participant Handout book. Participants may use these handouts readily throughout the training and refer to them afterward. For cost-effectiveness, the Participant’s Handouts are printed on white paper and can be distributed without binding. The ACC includes written and DVD materials that are easily used by the trainers and training participants. Icons and print variations are used in the Trainer’s Guide to denote training exercises and DVD segments. Traditionally, the NRCA has distributed curricula in hard copies—The Trainer’s Guide and the Participant’s Handouts. In the Trainer’s Guide, the trainer’s preparation pages are printed on blue paper; materials used in training are printed on white paper, and materials referenced but not trained are printed on pink paper. Participant handouts also are assembled in a separate Participant’s Handouts, which participants may use readily throughout the training and refer to afterward. We encourage the States to use the color coded system when the Trainer’s Guide is printed. For cost-effectiveness, the Participant’s Handouts can be printed and distributed without binding. The ACC includes includes a Participant Handout book that includes all modules. Participants may use these handouts readily throughout the training and refer to them afterward. For cost-effectiveness, the Participant’s Handouts are printed on white paper and can be distributed without binding. 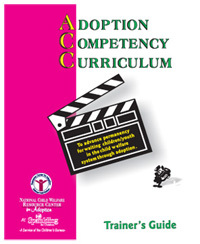 The Adoption Competency Curriculum is video driven and uses DVD segments to highlight, model and reinforce training concepts. The ACC DVD series is available for purchase, and the price covers the cost of shipping & handling. Download the order form.